The Mystery Method book, also known as the Venusian Arts handbook is the most useful, complete and influential book on seduction. It is the staple and the reference guide to all seducers that are serious about their skills. 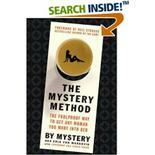 Nearly every other book mentions the Mystery Method in one way or another, either to praise it, like in The Game, or to improve on it. Reading the Mystery Method is enough in itself, but acts even better as a foundation on which to build on. Reading the Mystery Method is like reading a spell book, it gives you the tingling sensation that you have found the secret to seduction.